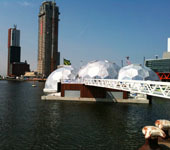 Rotterdam is an ambitious city, especially where it concerns architecture and sustainability. The European cultural capital RUHR.2010 pays tribute to this ambition via 2010LAB.tv by interviewing water architect Bart van Bueren and sustainability alderman Alexandra van Huffelen. Follow the link www.2010lab.tv/en/video/waterworld-dive-world-water-architecture to see and hear how water architecture lets Rotterdam take the lead in reducing CO2 emissions and to enhance its reputation as a city of architecture.